Attention! 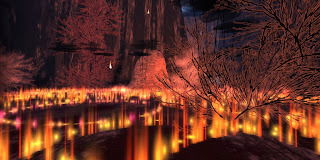 this event is in InWorldz, not Second Life!! You are cordially invited to the GRAND OPENING for my first-ever full-sim art installation! Come give me a hug or introduce yourself if we haven't met. Enjoy music by Chandra Deed noon to 1:30 pm PDT and Declan G 1:30 - 3 pm PDT! Feast on sushi! Ride a pink seahorse! Best of all, come see a story as told by a sim: the Age of Man has ended in a blaze of fire, famine, and warfare, and the Age of Acquarella dawns. The mighty goddess repopulates the oceans with aquarium outposts filled with creatures that survived in the coolest depths. Hoping to avoid the violent excesses of her forebears, she plans for these little oceans to be peaceful and pure. Alas, as they say, if you want to make the Devil laugh, make plans. Check out the unusual terraforming and land textures, the beautiful hand-drawn plants and exotic fish, the sea serpent, the rideable seahorses. Feast in the Sushi Pavilion. Look out for the 8-eyed monster - a true fear experience. Freebies and lots of cool stuff for sale in the Sim Store, too.